Do you remember heading up to Griffith Park to enjoy the spectacular Christmas Light displays? Driving or walking through the magically lit up pathways? LED/Projected Elephants delight you in Holiday Sweaters while colorful monkeys scamper about the grounds. Glittering Light Tunnels and so much more! Did you know that this magical display made the Top 2015 "Holiday Tradition" Destination List?! Additionally, L.A Zoo Lights has been nominated by USA Today's 10 Best Readers' Choice Travel Award for "Best Zoo Lights 2015". When L.A. Zoo Lights debuted last year, over 170,000 people enjoyed this wonderful experience! Perfect for a Date Night or new Family Tradition! I plan on bringing my family on their winter break next week. Sure beats driving around the neighborhood looking at lights. The 60-90 minute self guided tour brings your through select areas of the L.A. Zoo where you can experience the nocturnal animals, visit with reindeer, and see SANTA! Enjoy hot chocolate, churros, and other delicious holiday treats as you stroll through the zoo. L.A. ZOO LIGHTS is open every night, except Christmas Eve (December 24) and Christmas Day (December 25), from 6 to 10 pm Mondays through Thursdays, and 6 to 11 pm Fridays through Sundays and December 21 through 23. 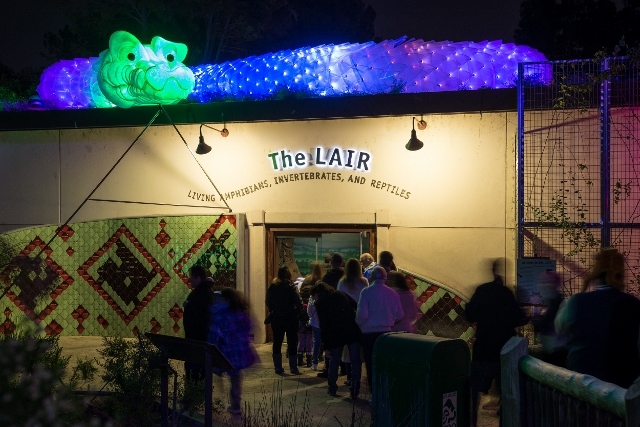 At the LAIR(Living Amphibians, Invertebrates and Reptiles) you will discover a HUGE illuminated snake on the rooftop while the inside holds ultraviolet light displays with insects of all kinds. 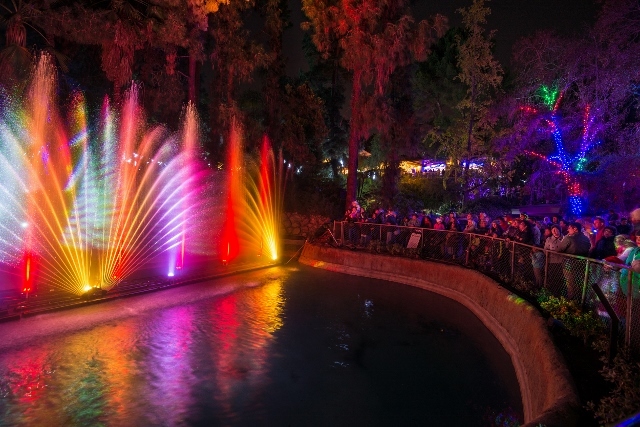 "Lightscapes: Wild Holiday" aquatic show boasting lighted fountains and shooting screens of water with majestic projections of fanciful animations set to music. In several special areas are a unique sound experience from Cirque du Soleil’s KURIOS – Cabinet Of Curiosities (performing December 10-February 7 at DodgerStadium) as well as music programmed by KCRW. The re-imagined Santa’s Village is in an all-new, glittering setting, the perfect location for magical holiday photos (available for an additional fee). Also new this year are two "VIP Experiences," including an exclusive HOLIDAY HAPPY HOUR for the 21-and-up crowd on December 10, and a FAMILY NEW YEAR'S EVE for all ages. Thursday, December 10, features "skip-the-line" express entry to L.A. Zoo Lights with a private lounge from 6:30 to 8:30 pm boasting hors d’oeuvres, beer, wine and hot and cold specialty cocktails. Tickets for HOLIDAY HAPPY HOUR are $75 per person. FAMILY NEW YEAR'S EVE on Thursday, December 31, 6 pm, provides an opportunity to celebrate the coming of 2016 in style with "skip-the-line" express entry to L.A. 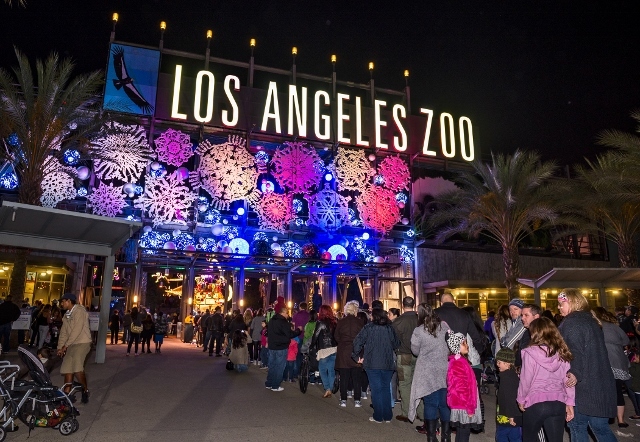 Zoo Lights, dinner buffet, soft drinks, complimentary champagne for adults, sparkling apple cider for kids, dessert, a ride on the Zoo's hand-crafted conservation carousel, crafts for youngsters, DJ dance party, cash bar and live broadcast of New York's Times Square ball drop at 9 pm, after which guests are welcome to experience L.A. Zoo Lights until closing. FAMILY NEW YEAR'S EVE tickets are $65 for adults and $40 for children, or $60 (adults) and $35 (children) for GLAZA members. Tickets for both "VIP Experiences" have limited availability, so early purchase is strongly suggested. General Admission to "L.A. ZOO LIGHTS" is $13 for adults/seniors and $11 for children ages 2 to 12 on Mondays through Thursdays (except on December 21, 22 and 23 when tickets are the same as weekend prices), and $16 for adults/seniors and $14 for children ages 2 to 12 tickets on Fridays through Sundays. Tickets for GLAZA members are $11 for adults/seniors and $10 for children ages 2 to 12 on Mondays through Thursdays (except on December 21, 22 and 23 when tickets are the same as weekend prices), and $14 for adults/seniors and $13 for children ages 2 to 12 on Fridays through Sundays. Children under age 2 are free. Tickets are also available for $9 after 9 pm on select nights. Visit LAZoolights.org for details and to purchase tickets. Click here to find more discounts!